As hinted yesterday, my November vacation was Disney World! For a week! Yes, it was fantastic. We stayed at Port Orleans French Quarter, visited in-laws, did Mission: Space, Soarin’, ate Moroccan food, laughed at Ellen & Bill Nye, geeked out at Spaceship Earth, loved Big Thunder Mountain and Test Track, enjoyed lunch with an Imagineer, and so on. The man of the house got to ride the remade Space Mountain — unfortunately a warning light blipped and they closed it down right as I got to the head of the line. I also didn’t get to try the Space Mountain capsules, though the man of the house thinks (based on how well he fit) I would have been fine. Ah, you may be wondering – how did I handle the walking? Um. I didn’t. I had planned to build up my walking ability before the trip but ran into problems. By the time I was getting on the plane, I was using a cane. Disney World, if you’ve never been, is very much A Land of Much Walking. Especially spread-out is Epcot, my favorite part of Disney World. Just walking from my room to the resort’s bus stop was a quarter mile; at the parks it would routinely be a quarter- to half-mile walk from the bus to the actual park entrance. Now, I could do a quarter or half-mile with my cane, but then I’d be done walking for a while. What to do? Well – I was fortunate: I was able to throw money at the problem. Wheelchairs of various widths can be rented at the parks for $12 / day. So can “electronic convenience vehicles”, aka mobility scooters or ECVs. These can’t leave the parks, but once you’ve rented one at, say, Magic Kingdom and return it (and get your $20 deposit back) you can get another one at, say, Disney Studios by just showing your paperwork and paying another $20 deposit. I paid $45 / day for ECVs, which was NOT cheap, but it was worth it to me. Many attractions require you to transfer from the scooter or wheelchair (mostly rides) but some allow you stay on the scooter or wheelchair the entire time. The Disney website has information on how each attraction works. The cast members are also very good at telling you how to cope. Since standing was more painful for me than walking, I generally rode the scooter “in line” if allowed. The weight limit posted on the Disney ECVs was 450lbs. I did not have to worry about charging them — in fact, I was told that if the battery died or I had any other problem I should call the rental office and they would bring me a new ECV. For me, this worked pretty well. I’d definitely get some walking done each day (spread out through the day) but NOT so much that I was in constant pain or re-injuring myself. I was walking better when I came back than before I left. There are several companies that market mobility scooter rentals in the greater Orlando area and cater to tourists. They will deliver the scooter to your hotel so that you’ll have it as soon as possible. If you’re using Disney transportation to get around, the buses, boats, monorail, and other Disney transport around Disney World are all scooter/wheelchair accessible. Often these rentals are priced by the weight rating. The rentals I saw that were up to my weight were $40-$50 a day, similar to the park ECVs, but if you don’t need a heavy-duty model you can get one a lot cheaper. Of course, if you have one of your own you can bring that too. 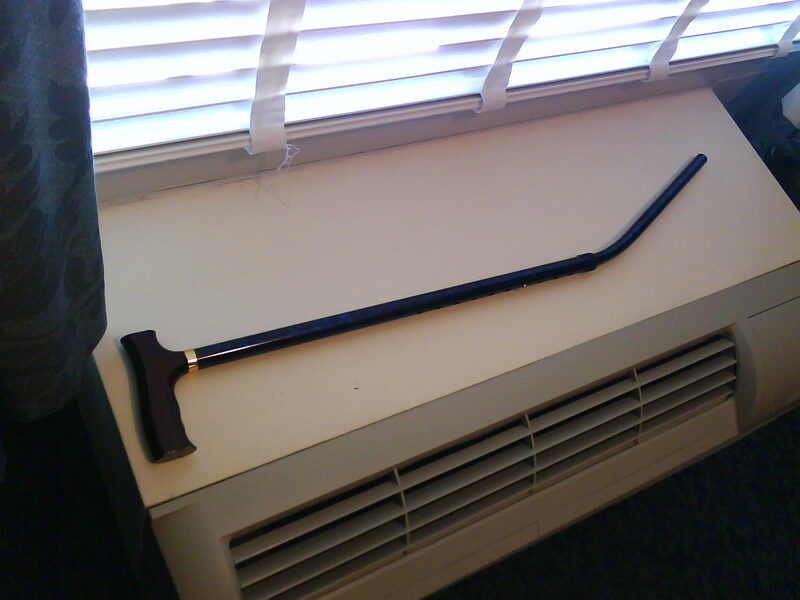 My cane, shortly before going home. This is the blue cane I picked up at the drugstore a few weeks before my trip. Note the bend! That somehow happened while I was on one of the rides; I left the cane with my scooter, came back, and found…something had happened. Ow. I am pleased to say that Disney’s customer service was very helpful — they referred me to a pharmacy that delivers anywhere on the Disney property, and paid for both a replacement cane and its delivery fee. It sounds like you had a great time! I love Disney but especially Epcot. I swear, Epcot sparked my love of travel and desire to immerse myself in different cultures when I was a little girl. The thing I remembered most about Disney (I’m a born and bred New Englander) was the flamingos. And the Pirates of the Caribbean ride (back before it was a movie!). ;) Oh yeah, and I remember going on Space Mountain, but my older, tough brother was too scared to go. That rocked. I’m glad you had a good time. I have very fond memories of my holiday to Disneyland about 15 years ago (and I live in the UK). I remember how much walking was involved! LOADS of walking :) Thanks! I haven’t been to Disney World since I was a fairly young child, but I did go to college driving distance from Disney Land. A good friend of mine has back problems and always rented a wheelchair when we went. They can definitely be a pain (a few poor patrons ended up with injured heels from stepping in front of the wheelchair without giving us enough time to slow down or stop), but it always made her visit so much easier! I went to Disney World last summer with my husband, and I was kinda sad when I visited EPCOT because it seemed like they could have really improved it over the years to address more current and upcoming technology. It was a blast from the past in a jarringly dull way, like nothing had changed since my last trip as a child in 1991. Don’t get me wrong, I loved my time there, but I left feeling a little unsatisfied. Oh and when we went to Disney, Space Mountain was still under construction-we were so bummed to find that out. I did see lots of changes since my last visit in 96, but I also was looking for them. Mission: Space rocked. Thanks for your vacation posts! It looks like you had a fantastic time! I’m curious about how many rides were appropriate for your size, and how you determined such. I’ve been wanting to go back to Disney for years, but fear the fun would be lost on me if I couldn’t do any of the rides. I’m so glad to hear that they had scooters available. It sounds like they’re pretty conscious of their patrons? Tell us more about lunch with an Imagineer!! The only ride I tried that didn’t fit on was the Raytheon one in Innoventions, and they have the seats out front so you can try it. I’m so glad you had a good time and were able to get around in a scooter. Sounds like alot of fun! Sounds fun- I’m so jealous! It’s tax season, aka my death work time. I’ve always wanted to see Epcot, I went to Disney World in ’96. I wonder what they’ve added since. I’ve only found your blog recently but have been reading pretty religiously ever since. When I saw this pop up I just couldn’t resist the urge to comment! I know exactly what you mean about the simulators, there used to be (maybe still is) one in Disney Quest, where you designed a ride then got to do it. When I went to have a go, I realised I couldn’t quite make it into the seat (this was before they had seats outside). The CM’s were really nice about it though and got us a fastpass for whatever ride was my favourite from the rest of the day though which was pretty cool. http://www.seatguru.com has details on both the seat width of various types of planes and the pitch (distance between rows). For a really small plane, such as a seaplane or a “tour” helicopter, they’re going to need to make sure the weight is distributed properly throughout the plane. Be prepared to state your weight and to pay extra if your presence means they can’t sell another seat. Thank you so much for the information!! I’m so glad you had a good time!! I was so encouraged to find your blog! I am 400 lbs and am about to leave for Disney World in about 3 days. I was very worried about the rides but I feel better now! I will certainly provide an update when we return!! Hello; Thank you for your post. We want to take a trip to Disney World but my larger sister thinks there are no rides for her to ride. We are all a large family over 300 lbs. Thank you so much, I am going to send this to my sister in hopes she will change her mind and do a family vacation to Disney World. This makes me happy. Disney seems to be so accomodating to everyone and I’m glad to hear they didn’t disappoint on your trip. :) I’m so jelly! It’s my dream vacation. I am glad you had a great Disney Trip. I too am plus sized (along with my husband) and visit Disney World 4 -5 times a year. I am a Disney Travel Agent and I can help anyone if you have questions. My email is Lisa@PixieandPirateDestinations.com Even if you just have some questions let me know!